Re-creation of 1880s frontier town, featuring portrayals of real-life cowboys and legendary events like gunfights and robberies. Museums and shops, townsfolk dressed in character portray early western life, visitors may pan for gold, inspect barnyards, also participate in stagecoach and pony rides. Picnic area and miniature golf. Open May through October. Formerly Action Park, part of larger Mountain Creek ski, hotel and housing development. Features over 30 rides with go-karts, mountain slides, miniature golf, batting cages. Water features include Zero G, world’s tallest and only double-looping thrill slide where riders enter enclosed launch capsule, then plunging into a translucent flume spiraling through two full loops before splashdown. Other rides include Colorado Rapids whitewater raft trip and High Tide Wavepool. Opened 1978 as attraction to supplement visits during off-season closures of adjacent Great Gorge and Vernon Valley ski areas, but series of subsequent financial restructurings and ownership changes. In 2015, Koffman family, one of partners in original Great Gorge ski area in 1970s, acquired Mountain Creek including ski, amusement and water park. Located 47 miles from New York City. Family amusement and water park oriented toward children under eight years old, but some adult rides including junior sized roller coaster and water slide. Amusement section includes Civil War locomotive ride, World War II cockpit, hayride and talking scarecrow. Pirate's Cove water park includes nation's largest wading pool; pirate-themed water slides and rides; and water playground. Indoor arcade with pin-ball, skee-ball and video games. Picnic area. Opened 1954, located in Warren County two miles south of I-80 near Jenny Jump State Forest. Indoor amusement park designed on theme of city streets and Jersey Shore boardwalk featuring over 200 video and skills games, two-level laser tag arena, 4D Theater thrill ride, Go-kart Speedway, Bumper Cars, Boardwalk and Mini Bowling. Opened 2011, 2016 expansion added Freedom Rider spinning coaster, largest indoor high-ropes course in New Jersey and meeting space. Also hosts concerts with live DJs and special events, restaurant and bar with alcohol, candy store. Promotes itself as "World's Largest Theme Park," over 200 rides, animal park and attractions on 510 acres. Park opened in 1974 by Warner LeRoy, Manhattan restaurant entrepreneur, on land previously donated by Switlik family, owners of Switlik Parachute Co. in Trenton, to Girl Scouts for use as camp and sold by Girl Scouts to group led by LeRoy. Great Adventure acquired park in 1977 to add to existing parks in Texas and Georgia, later renamed as Six Flags, now world's largest amusement park company with nearly 20 in US and abroad. Known for roller coasters, including Kingda Ka--tallest and fastest roller coaster in North America. Numerous rides, arcade and video games, restaurants. Safari park previously allowed drive through by individual cars, now restricted to group tours on trucks with guides. Located on Route 22 West 30 minutes from New York City. Family amusement park with selection of rides for children and teens, including Dragon and Crossbow roller coasters, bumper cars, merry-go-round, miniature train, Muzik Express, Drop Zone and Galleon Pirate Ship. Arcade with skee-ball, over 50 video games. Located on both sides of boardwalk in Point Pleasant Beach. One of few amusement centers to have haunted house, once common on boardwalks. Miniature golf, rides include two roller coasters, carousel, bumper cars, tilt-a-whirl, for both swing rides, Arcades with skee-ball, video games open year-round. Aquarium open year-round with sharks, penguins and seals, with touch tank allowing visitors to touch live animals such as sea stars and sting rays, offers workshops for children and teachers. Food stands, bar and live music in night club. First opened 1928 by Charles Jenkinson, remained owned by family until 1970s when purchased by Pat and Victor Storino, who expanded complex with new attractions. Located at former dock of steamboat service to Manhattan in Keansburg in northern Monmouth County. Fishing pier over Raritan Bay. Thrill rides such as Wildcat Roller Coaster, Double Shot, and Cliff Hanger, Log Flume, go-karts, bumper cars, tilt-a-whirl. Hollowgraves Haunted Manor returned to Keansburg from Seaside Heights following Superstorm Sandy in 2012. Also rock climbing wall, arcades with skill and video games. Dining includes snack bars and restaurants. Also operates adjacent Runaway Rapids water park. Features Grand Theft City Laser Blast with fog and bubble machines, state-of-the-art lighting and sound effects; Experience Viper Simulator full-motion, virtual reality attraction with 360 degrees of interactive pitch and roll technology; Monkey May-hem spin ride; Rock-Wall Climbing Adventure; Bumper Cars; Apache Helicopter Ride; children's Bounce and Play Area. Offers private party rooms with seating from 20 to 75, along with full-service snack bar and fresh-made pizza station. Follows Victorian design theme with Z-Brick walkways, oak benches, ornate lamp posts and Tiffany-style glass chandeliers and panels. Carousel with Bradley & Kaye molds of horses dating to early 1900's. Ferris wheel, tilt-a-whirl, games, arcades, snack bar and ice cream parlor. Free entertainment and free parking. Suffered extensive damage from Superstorm Sandy in October 2012, iconic photo of its Jet Star roller coaster knocked off pier into ocean widely published after storm. 18-hole and 36-hole multi-level miniature golf courses; Go-Karts; Kiddie Bumper Boats; Jr. Flume Ride; Tea Cup Ride; Merry Go Round; Dragon Wagon; Funslide; Rio Grande Train; arcade with boardwalk and video games. Features Dr. Floyd L. Moreland Historic Dentzel/Looff Carousel first built 1910 and relocated to Seaside Heights in 1932, one of only two vintage carousels (along with PTC carousel at Gillian’s Wonderland Pier in Ocean City) still operating in New Jersey. Carousel subject of campaign to prevent its sale, Seaside Heights acquired ownership in 2015 transaction with Pier owners to swap beach property. Grill and food stands. Pier owners also operate Breakwater Beach Waterpark across street. Located on Route 9 three miles south of Route 72, five minutes from Long Beach Island Causeway. Primarily center for go-karts, Kiddie Go Karts, Single-Rider Go Karts and Double-Seater Go Karts. 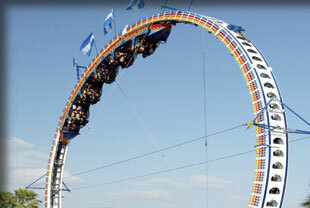 Limited collection of outdoor thrill rides including free fall ride, sky glider ride and The Tornado. Bungee trampoline ride; golf driving range; batting cages; miniature golf; and arcade. 20-hole miniature golf course, go-kart track with bridges and tunnels and bumper boats. Batting cages with pitching machines up to 92 mph, Battle Tank Tags where players can ride as gunners or drivers in their special battlefield. Located southeast of Toms River 5 miles from Garden State Parkway. 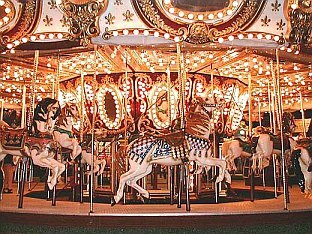 Indoor and outdoor rides and games on Ocean City boardwalk. Best known for 144-foot Giant Wheel, one of largest Ferris wheels on east coast. Carousel built in 1926, also 35 rides for adults and children, including slide, monorail, raceway whip, kite flyer and glass maze house. Founded 1929 by David Gillian, remains in family ownership. Gillian's Funland of Sea Isle City opened 2009 by another family member closed 2014, largely due to damage suffered in 2012 from Superstorm Sandy.. Rides include bumper cars, Ferris wheel, hot air balloon ride and merry-go-round, thrill rides include Gravitron where centrifugal force explodes at speed of 24 RPM's, upside down roller coaster and Wipe Out ride where guests twirl and tumble while suspended 43 feet high. Go-Kart Speedway. 19-hole miniature golf theme park featuring replica of Ocean City's historic shipwreck "The Sindia," and maritime fishing village. Concession stands. First opened to public in 1898, became iconic image of Atlantic City at its peak in 1920s, rebuilt several times from storm and fire damage. 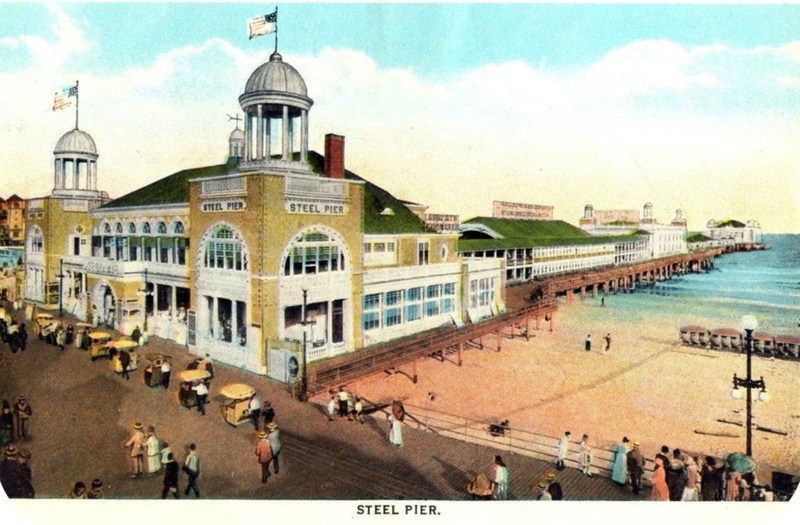 Originally a theater which hosted prominent entertainers including John Philip Sousa and his band, Al Jolson, Frank Sinatra and the Beatles, expanded to include attractions, rides, and corporate exhibits. Best known for "diving horse" performances which began in 1928 and continued for 50 years. Owned since 2011 by Cattanoso family, which leased it for prior 20 years from owners including Donald Trump, former owner of bankrupt Trump Taj Mahal across boardwalk. Current attractions include double-tiered carousel and Ferris wheel; 25 adult and children's rides including Slingshot thrill ride which goes from 0 to 225 feet in 1.5 seconds reaching speeds over 100 miles per hour; arcade with basketball, pin-ball, video and other games. Offers helicopter rides over ocean and Atlantic City. Open year-round, oriented toward children up to 10 years old, pursues fairy tale theme with characters like Mother Goose, Goldilocks. 17-acre facility two miles west of Garden State Parkway with 15 rides and small zoo with goats, peacocks and chickens. Rides include Rockin' Tug, Tick-Tock Clock Drop, Beanstalk Bounce, Happy Dragon and Jumping Jumbos. Founded 1955 by late Esther and John Tricano, remains in Tricano family ownership. One of largest amusement complexes in state, includes three amusement piers and two beachfront waterparks. Family owned and operated since 1969, currently run by 2nd generation brothers, Will and Jack Morey. Over 100 rides and attractions, in 1979 established one of first water slides in US. Mariner's Landing section features Giant Wheel, 156-foot tall Ferris wheel; along with scooter and tea cup rides. Adventure Pier includes Grand Prix Raceway, coaster The Great White, carousel, a maze, batting cages and kiddie rides. 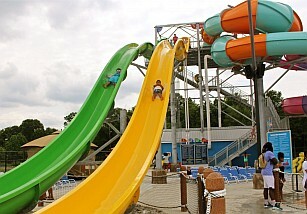 Raging Waters Waterpark pursues shipwreck theme, kiddie play areas at Shipwreck Shoals and Camp KidTastrophe along with speed slides, Shotgun Falls and an activity pool. Ocean Oasis Water Park and Beach Club with Cliff Dive slide and 5-story drop; six-lane WipeOut! slide race course; Lazy River tube slide. Bonsai Beach interactive children's play area with water jets, climbing ropes and slides. 25-acre complex of air conditioned indoor and outdoor attractions including Splashplex waterpark. Bumper cars, indoor electric go-karts, laser tag, bowling, outdoor pool, Free Fall ride with 30-foot drop, 4D Dark Ride, mini golf, tilt-a-whirl, Fun-A-Whirl, AirShot, 2-Story Foam Frenzy, updated arcade with over 100 games. New Funplex Boardwalk with midway games and new rides Fun-A-Whirl & AirShot. Cafe that serves snacks, hosts birthday parties and special events. Roller skating with kids and adult roller hockey leagues, indoor multi-level jungle gym, 18-foot Inflatable Slide and 36-foot Inflatable Obstacle Course, snack bar and arcade. Hit music played by disk jockeys, largest Tween night in South Jersey every Friday. Indoor amusement park with nearly 20,000 square feet of space. Twirlin' Taxi ride, Rollerball Bowling and Black-light Mini-Golf, Ballocity multi-level soft play and slide area, and Gem Mining and DinoVenture attraction. Skeeball and basketball, classic arcade and racing games. Snack Bar. Nation's only construction-themed adventure park. Children and adults can drive, ride and operate real construction equipment, including backhoe, excavator. 23 attractions such as Sky Shuttle, Operation Battle Truck, Mini Diggers, Skid-Steers, and ARGO Off Road. Kid Zone play area, Diggerland Arcade, and Barrel Train. Daily stunt shows featuring construction crews with heavy machinery acrobatics. Situated on over 14 acres of land in Camden County. US tallest ropes course. Amusement and water park 15 minutes from downtown Philadelphia on Clementon Lake. Giant Ferris Wheel and vintage carousel. Thrill rides include Laguna Kahuna, five-story, one-acre Polynesian water play land; Ring of Fire, 60-foot looping coaster; Thunder Drop 100-foot free fall; and Torpedo Rush, world’s tallest dueling trap door speed slides. Safari Train and Castle Bounce for younger children. Also operates adjacent Splash World water park. Among oldest operating parks in US, opened in 1907 as simple swimming operation on Clementon Lake, steadily added attractions. Acquired in November 2011 by investor group led by former Six Flags executives. Two indoor turf fields, roller skating, 5-level indoor jungle gym, 18-foot Inflatable Slide, snack bar, arcade. Disk jockeys play all hit music while playing games and interacting with kids. Programs and leagues for youth and adults including roller skating and hockey, soccer, lacrosse, volleyball. Two other locations in Deptford and Mount Laurel.